This frozen dinner's colorful box claims that the chicken, corn and pasta inside are a good source of five vitamins and minerals. Look more closely at the nutrition label, however, and you'll see that the sodium content is nearly 200 mg more than the recommended maximum for a full meal. 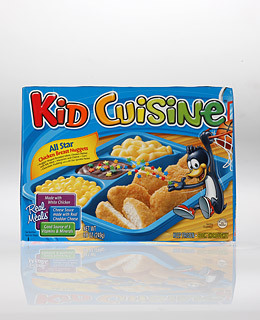 Better choice: Kid Cuisine's Twist and Twirl Spaghetti with Meatballs. It's a source of seven vitamins and minerals and much lower in sodium.